Views from the loch. : The ultimate battle! Photo 01 - Stevie's plump one and a half pounder! Next Saturday will see our wild Trout competition being held on the loch for the sixth year in a row. The competition is open to all so if you think you can outwit our head of wild Brown Trout come along and have a cast. The day begins from 09.15 onwards with registration at the Glen Cafe where Cath and Lisa will serve up tasty bacon rolls along with piping hot coffee. After registration competitors may move to their preferred spot to commence fishing and when 10.00 comes round the fishing may begin. You may fish all around the loch with the exception of Rodono House which is next to our boat launching area, if you are unsure of where this is please ask! Fishing will cease at 16.00hrs and anglers should then make their way round to the Tibbie Shiels Inn where the weigh in will take place. Please note any angler arriving after 16.30hrs will not be allowed to weigh in any fish unless there is a very good reason for this lateness! Following the weigh in there will be the presentation of prizes and the club will stand every competitor a drink of their choice to wash down what always turns out to be a most splendid barbeque cooked up by Alastair The weeks leading up to the competition have shown the resident Trout up for a bit of sport readily taking anglers offerings! So if you want to come and take part simply come to the Glen cafe around 09.15hrs and we will get you sorted for the day ahead! Entry is £16.00, unchanged since the inception and entitles you to your fishing, pre fishing breakfast at the cafe and barbeque at the Tibbie. As always the first prize is a day’s autumn Salmon fishing on the Upper Pavilion on Tweed with access to all the pools! In addition the winner will receive membership of the club for a year worth £55.00! Second prize is a bottle of spirits and third prize is a box of flies suitable for fishing on St Mary’s! We would like to wish all competitors in what is the ultimate battle tight lines! 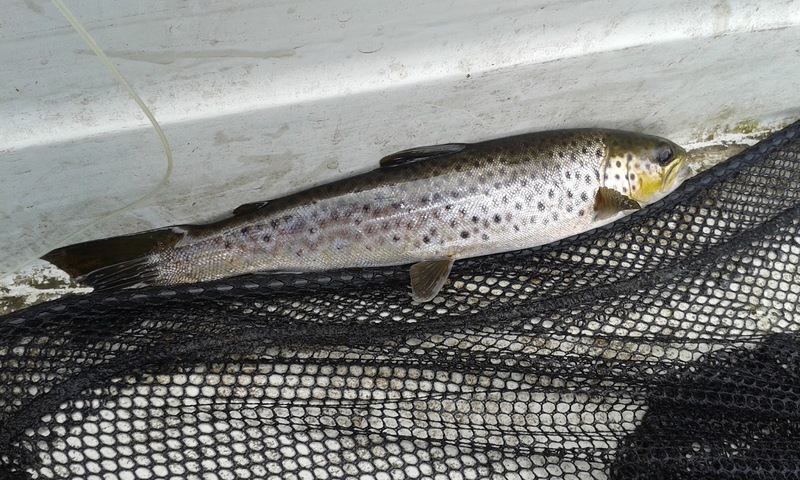 Update – Three fine Brown Trout fell to three of our regular Trout hunters, Alasdair White caught a fine 13in Trout on a Blae&Black at the bottom of the loch whilst our ever young Pete Young managed a half pounder on a wee glodhead and Stevie Nimmo landed and returned a super 1.5lbs Trout (photo above) in what would be best described as Baltic conditions with a biting cold wind and frequent hail showers! 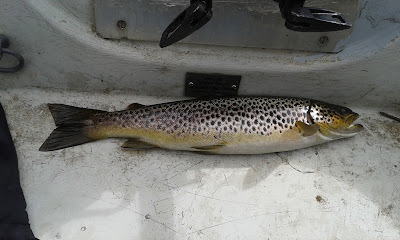 Hopefully the weather will improve for next week but the pointers are showing our head of Trout are up for a battle irrespective of the weather! Photo 02 - Pete's half pounder! It seems some rumours are circulating regarding the hiring of our boats and engines. Specifically the rumours relate to our club engines and the spectrum for their hire in that the engines are only for the use of club members! I don’t know where this rumour came from but a rumour is exactly what it is. At no time has it ever been suggested that we do this and we will not be implementing this! Engines are for the use of members and visitors alike and we will continue with this open policy so if you want an engine provided it is not already booked you will be able to hire one. The second rumour circulating is that the lochs will be closed to all visitors and only be open to club members! This has been on the agenda in the past during a period of excessive fishing but at this time it is not up for discussion. So if you want to know if something is an unfounded rumour just ask our loch keeper or a committee member and you will get the real story! Nothing more than a bad joke! It was with much amusement that I watched the Borg Queen Ruth Davidson introduce her policies for the forthcoming election. Of note was the fact that she is not in the race for government but wants to be the official opposition. Now there’s a first a “politician” campaigning to be a poor second! She and her misguided band of lost sheep seem as yet not to have found enlightenment and are still running around chanting no to a second referendum! Interestingly whilst it should be the SNP banging on about another referendum it’s the Tories who seem obsessed by it! I used the word policies above because it is the spine of any political party prior to an election. Astonishingly the Tories do not have any policies just a collection of negative random headlines that since they will never get anywhere near government they won’t be required to explain further! Any slight hint towards policy seems to be simply passing on the machinations of Westminster and look at the almighty mess they are creating! Yes the person who crowned her the Borg Queen got it spot on, the Borg a star trek creation are creatures incapable of thinking they simply carry out the wishes of their master! They seek to be the main party of opposition and hold the SNP to account. Did you ever hear such nonsense! The woman who could not even get her tax return correct (she underpaid by £3.80) seeking to challenge thought out policy! She is incapable of holding any party to account or any politician for tat matter! It’s a joke albeit a very bad one. The reality is that these buffoons even if they did end up as the largest party of opposition (highly unlikely) would end up pushing floor polish around as the SNP wipe the floor with them. A bunch of lost and ineffectual fools unfit to be tolerated by the people of Scotland! Tories in Scotland are alien species! Honestly they are just there to make up the numbers. They have no vision, no aspiration and no gumption whatsoever. They will be wholeheartedly and rightly rejected by the people of Scotland. The mistake they made and have consistently made is to treat the people of Scotland as fools thinking they will happily swallow a double dose of Lord Snooty’s cure all potions. The bottom line is that Scots can see through them and they are destined to be sideline jesters to provide mild amusement. Already the gaffes are coming thick and fast! The Borg Queen and her followers are not serious politicians worthy of consideration why even a vote for a Puppet (Lib-Dem) would return more in the way of benefit! They do have some support though, wealthy farmers, big landowners, the elite of Morningside and other such affluent areas but for the general population they have no attraction whatsoever. If you would like to reward the rich and punish the poor then vote for them! If you want an independent fairer Scotland with money being wrested from the super rich then vote SNP and if you are looking for a home for your second vote then vote Green!